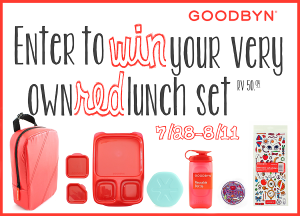 Goodbyn Lunch Set Giveaway | A Savings WOW! It’s hard to believe, but my kids will be going back to school in just a few weeks. I am always looking for tools that will help make the school year easier. Having a way to keep my kids’ lunches organized is definitely on the list. Take a look at this product to help you with your kids’ lunches also! Welcome to the Goodbyn Lunch Set Giveaway! Hosted by: Sweet Southern Lovin and sponsored by: Goodbyn! Goodbyn is a small company that started in 2008 in Naperville, Illinois. Goodbyn wanted to reinvent the way kids ate lunch. They wanted to make lunchtime fun for both kids and parents all while making it easier. Goodbyn is designed in Chicago. They started out as an American brand, made in the USA, but after four years of being in business they became an international brand. Goodbyn is now being sold in over 25 countries. Goodbyn has always had the goal to reduce the problem of trash from the one-time use packaging and offering products that are an affordable price. By making the prices more affordable they expanded their line and now make their product overseas. Goodbyn works with well established factories. The factories are working towards sustainable practices and they maintain high-safety standards. Check out Sweet Southern Lovin’s full review here. Enter using the Entry Form below. By entering you agree to abide by the Terms and Conditions listed on the Entry Form. All winning entries will be verified. Winner will receive an email from Shellie@sweetsouthernlovin.com and will have 48 hours to respond or a new winner will be chosen. One of my granddaughters school lunch. School starts August 7-not that far away! !